Do Ho Suh's "Home Within Home" was a smash hit. Literally. 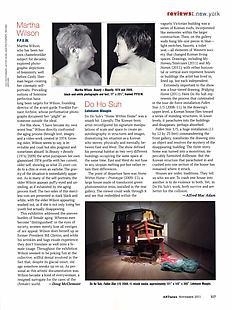 The Korean-born artist reconfigured his signature manipulations of scale and space to create an autobiography in structures and images, dramatizing his situation as a Korean who moves, physically and mentally, between East and West .The show defined his personal habitat as two very different buildings occupying the same space at the same time. East and West do not fuse in any utopian melting pot but rather retain their differences. The point of departure here was Home Within Home – Prototyped (2009-11), a large house made of translucent green photosensitive resin, installed in the rear gallery. The viewer could walk through it and see that embedded within the vaguely Victorian building was a series of Korean roofs, incorporated like memories within the larger construction. Then, on the gallery walls hung life-size pieces in blue light switches, faucets, a toilet seat-all elements of Western society that changed Korean living spaces. Drawings, including My Homes/Staircases (2011) and My Homes (2011), with either horizontal or vertical axes represent houses or buildings the artist has lived in, lined up, but each independent. Extremely important to the show was a four- tiered drawing, Bridging Home (2011). Here Do Ho Suh represents the process that culminated in the tour -de-force installation Fallen Star 1/ 5 (2008-11). In the drawing's upper level, a Korean house flies toward a series of standing structures. In lower levels, it parachutes into the buildings and disappears, perhaps absorbed. Fallen Star 1/ 5, a huge installation (11 by 12 by 25 feet) commandeering the front gallery; transforms the drawing into an object and resolves the mystery of the disappearing building. The three-story home was turned into a monstrous, impeccably furnished dollhouse. But the Korean structure that parachuted in and crashed into one section of the house has disappearing building. The three-story home was turned into a monstrous, impeccably furnished dollhouse. But the Korean structure that parachuted in and crashed into one section of the house has remained where it struck. Houses are order, traditions. They tell us who we are. To crash one house into another is to do violence to both. Yet, in Do Ho Suh’s work, both survive and are better for the collision.